You enjoy the finer things in life, that's not to say you were born with a silver spoon in your mouth, you just know how to have a good time. With you, vacations are never half-hearted, even a trip to visit the in-laws might include a roadside stop to try the homemade blueberry pie advertised on a billboard. Your wardrobe is always smart and tasteful with a little bit of flare. When you choose restaurants, you tend to bring your friends and family to some delicious sites. When it comes to silver wear, you don't have to take one of those internet quizzes to figure out what role you would play. Forks are always delving deep into salads and mystery casseroles. Butter knives, though their role with peanut butter is tempting, are often brought out just to be dragged across dry toast with the smallest amount of butter, not the life for someone like you. The life of a chopstick is complicated and usually spicier than most people are comfortable with. Now, the life of a spoon is something to shoot for. They regularly are dipped in cartons of sweet, melty ice cream or submerged in hot bowls of delicious soup that would feel just like a hot tub to cool metal instruments. Yes, if you had to be reborn as a utensil (we're not sure how that works in the cycle of karmic rebirth) you would surely be a spoon. 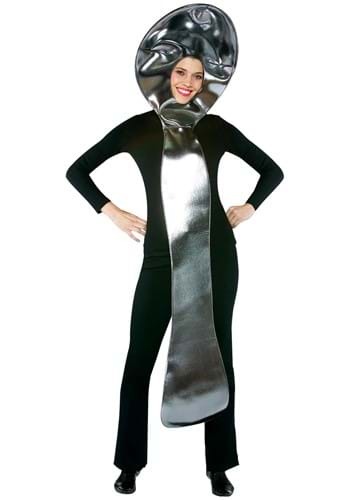 Whether you're going to the national soup convention or you want to choose a costume that truly represents you this year, this spoon costume will not disappoint. Do us a favor, if you meet that delectable dish, try to contain yourself. We don't need the dish running away with the spoon, it's been done before.